Switzerland provides a successful example of a country upgrading its broadcast systems from DAB to the second generation DAB+ digital radio. DAB was initially launched by SRG SSR, the Swiss public broadcaster in 1999 and since then three regional multiplexes have covered the German, French and Italian speaking areas of the country, with SRG SSR programs in the DAB standard. In 2008/2009 SRG SSR added a fourth multiplex for the Rumantsch speaking area and the commercial broadcasters added a second multiplex in the German speaking area. From the beginning these two multiplexes have been broadcasting in DAB+. A successful digital radio market, Switzerland has the highest DAB outdoor coverage of any country (outdoor 99%, indoor over 90%), over 1.4 million nationwide listen to services on air and over a million receivers have been sold. Switzerland is also a country that has a very clear migratory strategy from DAB to DAB+. The strategy looks at ensuring that the whole digital radio value chain is addressed. Especially for the commercial broadcasters the use of DAB+ was essential to start Digital Radio with acceptable costs. The costs of the technical changes for the upgrade to DAB+ for SRG SSR are a minor factor since only an upgrade of the playout is necessary and the whole transmitter network infrastructure stays untouched. But to inform those listeners with legacy DAB receivers in an efficient manner was key to success. The costs of this necessary action were high. Currently, about one third of all households have access to a digital radio. 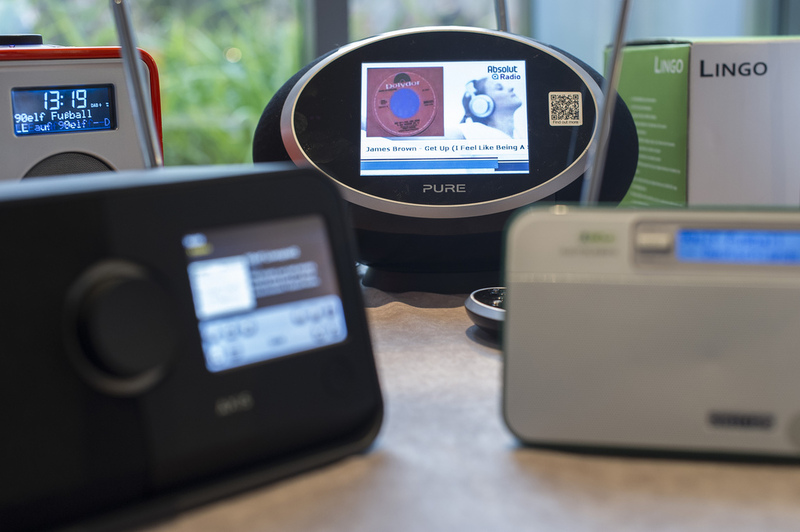 All radio and TV retailers as well as the major chains in Switzerland sell DAB+ receivers with a wide range of different devices. More than 80 brands and over 400 different models are currently available. Since 2008 nearly all retailers have been selling DAB+ receivers only. Therefore only 5 to 10% of all receivers sold until the transition were legacy DAB receivers. To increase the acceptance of the transition, the most listened programs (2 to 3 per multiplex) remain in low quality DAB until 2015. For a seamless in-car user experience Service Following is seen as key in Switzerland, and the public broadcaster SRG SSR has pioneered this issue. SRG SSR has also defined two regions for test drives, working in close collaboration with the car manufacturer industry. Switzerland is also a pioneer in DAB/DAB+ tunnel re-broadcast systems. There are currently eight tunnels equipped and the plan is to cover up to 200 tunnels using 100 head-ends and 1,000 transmitters. In a pilot tunnel SRG SSR has tested and specified emergency voice break-in, signal levels, system design and interfaces. MCDT, the Swiss digital radio marketing company, is working closely with automotive manufacturers providing technical information, running marketing campaigns and holding events to bring automotive manufacturers and dealers together to promote digital radio. Since 2006 the Swiss DAB broadcasters have worked in close cooperation with manufacturers, importers and retailers with the aim to create a successful eco-system for Digital Radio. Since 2010 MCDT has planned and coordinated this work and has also planned the campaign for the migration to DAB+ which has been embedded into the ongoing overall activities to promote Digital Radio. The manufacturers and retailers supported the step to DAB+ with special promotion offers. The B2B activities coordinated by MCDT laid the foundation for the successful cross media marketing campaigns and for all activities within the radio programs itself. The migration to DAB+ has been received by the audience as a positive message. As a result over 250,000 DAB+ receivers were sold in 2012 alone. For SRG SSR the choice to migrate to DAB+ is based on the enhanced reception quality and the higher number of services offered by the second generation standard. This entry was posted on May 6, 2013 by WorldDAB in Automotive Industry, Benefits of Digital Radio, Content and Services, Digital Radio Rollout, Europe, Feature Article, Marketing, Receivers.